Functional, but just a turd to look at. 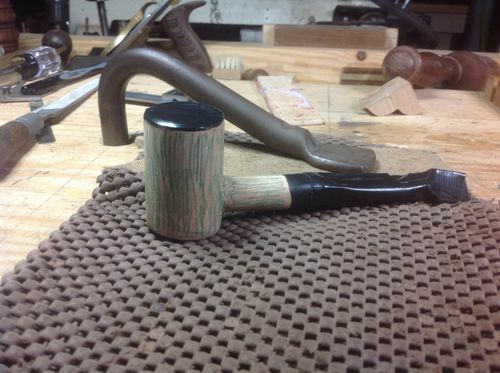 By joining a pipe making forum online, I soon learned a well-made pipe had defined shaping. Especially a crisp junction between the bowl and shank. Symmetry is extremely important, as is the finish! Armed with that knowledge, I attempted a fat, rounded bowl since I love this shape the most. I have also learned sandblasting this briar is significantly more difficult than expected! It takes roughly 20 minutes in real time to blast something this size, after being removed from the cabinet for multiple inspections. The tough part is achieving an even texture on the entire surface due to poor vision while blasting. 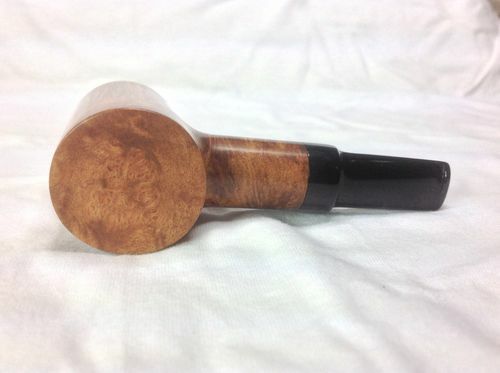 Next, another rounded bowl with a flared shank, and Ziricote ferrule. I re-sanded this one many times while experimenting with different stains and finishes. A little better pipe than those I made last year, but still a turd. Then, a heart-shaped pipe. I spent much more time shaping this one to preserve symmetry on the bowl. 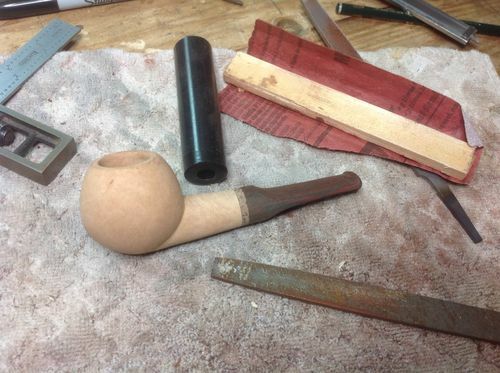 The airway and tobacco chamber is turned on the lathe, but the outer shape of these pipes is roughed out with a 1” belt sander and refined with handheld files. Much better! 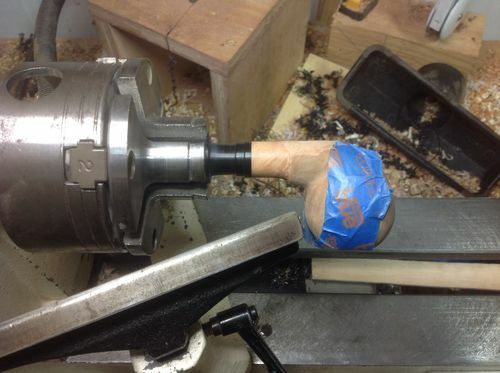 The pro pipe makers have had time to critique my early work, and NOW I have a clue how to proceed. This pipe won’t be smoked since there’s so little wood underneath the bowl (beginner error! ), but the finishing practice was invaluable. I’ve never really liked a Poker shaped pipe since I thought it was a boring shape. However, while attempting to make the 2 perfect cylinders of shank and bowl meet, I gained a new respect for Pokers! This is harder than it looks, and I’ve made saw handles with lamb’s tongues. Easily, my best pipe to date! 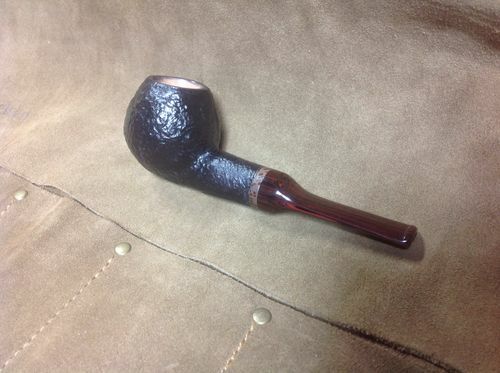 German Ebonite for a stem. 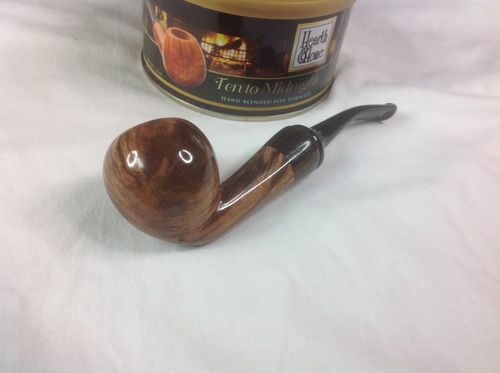 My daily pipe now. And, to drive home what I just learned, another Poker. This one with a shorter Ebonite stem so it can sit balanced on the bench. Nice! One of my best skills is learning. The pros online have taught me how to make a sweet pipe. Careful attention to shaping; and an all-out perfect finish. 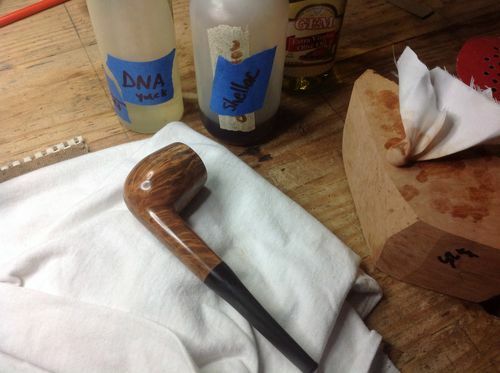 The ‘contrast staining’ on the last 2 smooth pipes is the real trick to learn. No one will give a recipe on how that is done since it can make the difference in sales. But, reading and experimentation allowed me to find a few secrets! This method of finish involves many coats of dark leather dye being applied to the wood, and sanded mostly off. It seems like an extreme technique, but is quite effective at highlighting scratch marks so they can be removed with subsequent grits of sandpaper. And, it colors the grain in the beautiful briar. Shellac is used for a topcoat. No buffing wheels used on my pipes. 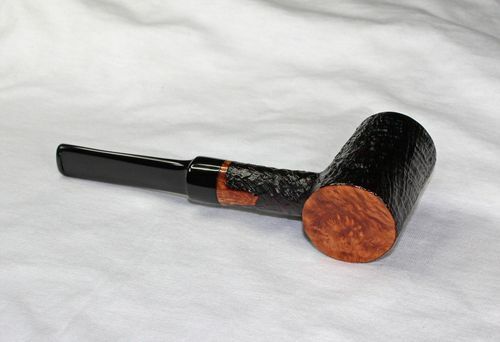 Lastly, here is my first attempt at the classic Billiard pipe. 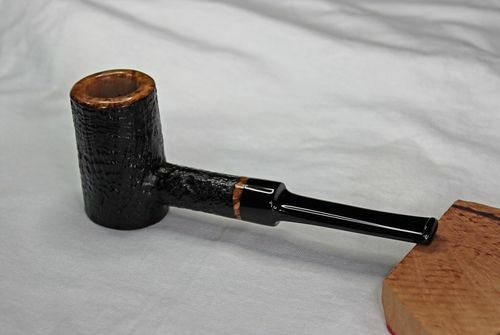 This shape always looked bland to me, but it is the gold standard for pipe makers to show they understand the subtle curves and proportions involved. A Billiard is either correctly shaped, or a trained eye can spot the mistakes a mile away! Now, I’ve progressed to a full blown French polish. A bit time consuming, but that perfect finish is what matters the most on these small projects! All these pipes were made from Briar, the root of the Heath tree which grows around the Mediterranean Sea. ‘Discovered’ mid 1800’s and used for high end pipes since. All stems were made from solid round stock of Ebonite. Truly amazing Terry. Thanks for sharing. Man, you have mastered the trade. Very nice work. Cool journey, Terry. I look forward to the day of owning my very own TRP. Thanks for sharing your good looking pipes. 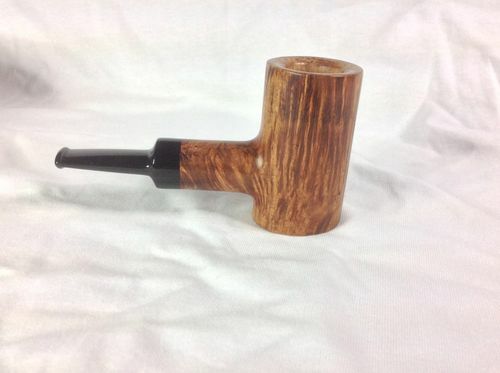 I’ve smoked pipes since the mid 60’s but never tried making my own briar pipes. MAFE sure would like your creations. Do you sell your pipes or just make and smoke them? I may have to come spend a day with you to learn how to make pipes. 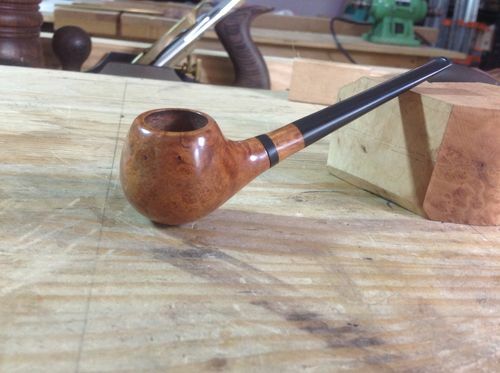 Do you have a picture of all the pipes you’ve made?
. Amazing work my friend, The Two tone is my favorite. 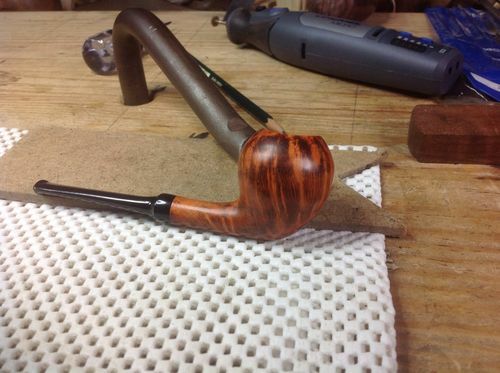 I can see a lot of thought &patience went into making and finishing these pipes. Those are works of Art! And they must provide pleasure when smoking them. Like them all! Excellent pipes. I’d love to see them being turned!! Wonderful pipes, I love that last poker, that would also be my favourite. Really fine work and wonderful to see the journey you have made. Mat the smoke be with you! Gret post Terry. I obviously have the untrained all, because they all look good to me. You really do nice work. This was an interesting read. 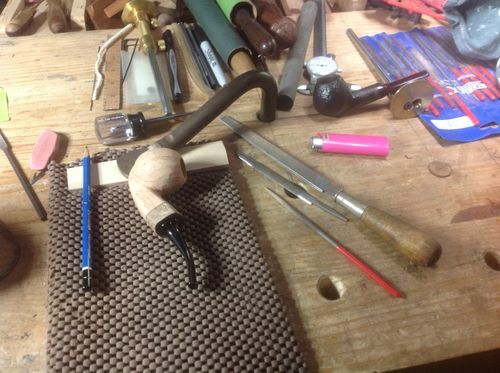 How much time is involved in making a Billiard pipe? I have read that due to the unavailability of imported briar during WWII pipe manufacturing started in Sparta, NC using local rhododendron wood. After the war they switched to briar.